Yumzers! So y’all were totally into Marcus Samuelsson’s Salmon Gravlax Recipe? Here are 11 more scrumptious salmon experiences for you to try. Salmon is a versatile fish to cook with. We start off with 10 different methods, photos courtesy of Pinterest, that you can use this fish in your recipes which you can further research. Then, for your final salmon extravaganza watch the 2008 flashback Honey Salmon Recipe video (below) that I made with the well-known cooking queens, The Get Em Girls. [dropcap]T[/dropcap]he salmon fishing season is now in full swing in Scotland and Seattle, as it is every year between the middle of January and the end of September. Many anglers fish purely for the thrill of hooking a whopper and pulling it out of the river, but once you’ve caught your salmon (in the supermarket for most of us), what do you do with it? Perhaps the easiest and healthiest way to enjoy your catch is to simply grill it. Season with some salt and pepper and cook under a medium grill for 8 to 10 minutes on each side until it is cooked through. Delicious with salad and new potatoes. 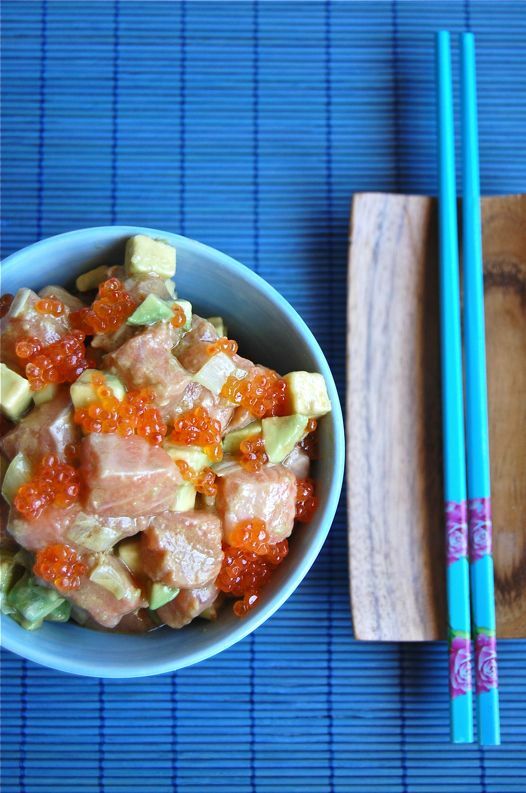 Japanese food, including sushi and sashimi have become increasingly popular in recent years and eating small slivers of raw salmon with rice or seaweed and a blob of wasabi is delicious and the perfect snack or lunch on the go. Making fish cakes using potato, vegetables, chilli, garlic and herbs is a great way to use up little pieces of salmon trimmings which aren’t large enough to grill or use in other ways. There are many different dishes which involve salmon wrapped in puff pastry, such as coulibiac from Russia and a traditional salmon en croute which is a great alternative to a beef wellington or traditional Sunday roast. Salmon is one of the few fishes which stands up well to being put in a curry, and one of the best ways to use up the fillets you have caught with your fishing tackle and hours in the river is to make an aromatic red or green Thai salmon curry. A classic Italian combination, salmon with a creamy white wine or yoghurt sauce and a long, thin pasta like linguine or spaghetti makes a really quick and tasty dinner when you’re in a rush after work. Cooking “en papillote”, or in paper is one of the best ways of keeping all of the flavors in. Wrap your piece of salmon along with ingredients like spring onions, chilli, garlic, lemongrass, tomato or pesto, and cook it for 20 minutes in the oven. Use the juice which collects in the parcel as a sauce. Smoked salmon is one of life’s little luxuries and it’s delicious either on a bagel with cream cheese or served for breakfast with scrambled eggs. Always buy as good a smoked salmon as you can afford and go for Scottish salmon rather than cheaper imports. If getting your kids to eat fish is a struggle, they will love salmon burgers. Blitz up salmon with some breadcrumbs, egg white, onion and herbs, and serve in a burger bun with tomato and lettuce. If you’re a Mexican food fan, think about using chunks of salmon in your fajitas along with guacamole, soured cream and vegetables instead of chicken or beef. Not really authentically Mexican, but certainly a tasty alternative. So now you have some great ideas of how to prepare and eat your Salmon, get your fishing tackle ready, hit the riverbank and go catch a whopper! Our salmon recipe wrangler Morag Peers is a mother and blogger who loves to cook. Find out more on Morag’s Google+ page. Too Fat to Be Loved! What Does It Take to Deserve A Relationship? Pole Fitness for Health, Beauty and Sensuality – Yes!